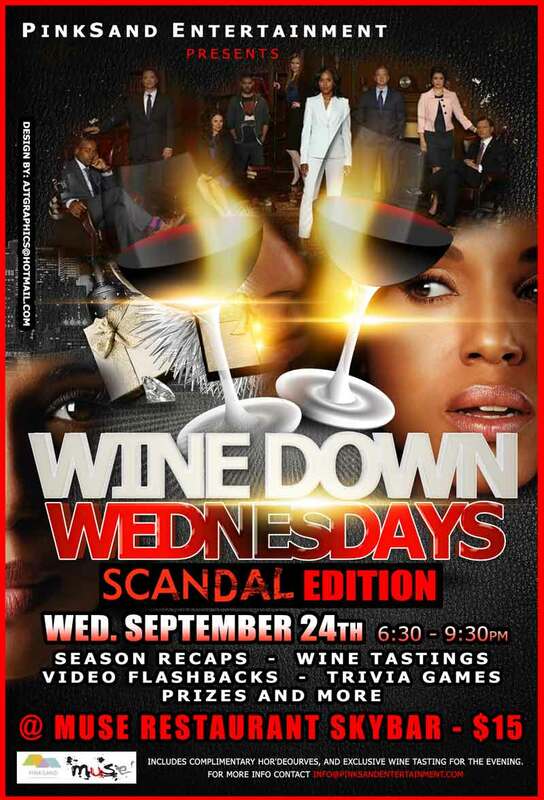 PinkSand Entertainment will be hosting “Wine Down Wednesdays – Scandal Edition” on Wednesday September 24th from 6:30pm at Muse Restaurant SkyBar featuring a Scandal quiz with prizes, video recaps, predictions for this season, conversation and more. The promo flyer said, “This month will see the return of ABC network’s hit primetime drama Scandal starring Kerry Washington as the formidable – Olivia Pope! Get ready #gladiators because this next and final season will definitely have us holding on to seats, crashing Twitter, and drinking bottles of red.